And although, I am not among these girls that tend to eat their lipsticks away within the first ten minutes (like my sister), I have some tricks to keep it on for hours. Exfoliate your lips. By exfoliating your lips not only do you get the most out of your lipstick, but you also end up with a smoother surface for your lipstick to adhere to. Apply a moisturizing lip balm and leave it on for a few minutes. Apply a light coat of a long wearing foundation to lips as a base. This will act as a primer (and a barrier to licking lipstick) and since you have applied lip balm it won’t dry your lips. Outline your lips using a lip pencil, but not just any lip pencil. Try using Estee Lauder’s Double Wear Stay-in-Place Lip Pencil which comes in 14 different shades. This amazing lip liner wont dry your lips, and so you can apply it all over your lips. a. Apply MAC’s Pro Longwear Lipcolour (10 shades) or Pro Longwear Lustre Lipcolour (6shades) for a shinier result. This lipstick is simply LONGWEAR! It wont Smudge, run, transfer, stays on intact for a while, plus it won’t dry your lips. b. Apply your favourite lipstick and blot lightly. Just be aware that the shinier and more hydrating your lipstick is the less it will last. Add some gloss. 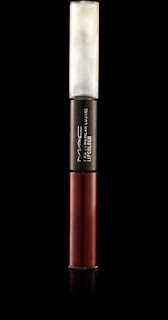 MAC’s Pro Longwear Lipcolours come with their own lipglosses that have a unique thicker formula against melting the lipstick. Try using this lipgloss in the center of your lips and you will have long-term results. You can follow the same procedure over your own lipstick, but I have to warn you it won’t last as long!!! Ahh we love to find out how to keep our lipstick lasting all day.. thank you !